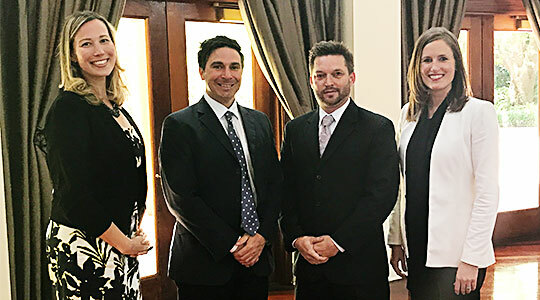 Stirling Properties commercial real estate agents were honored during the New Orleans Metropolitan Association of Realtors (NOMAR) Commercial Investment Division (CID) 24th Annual Achievement Awards ceremony. Beezie Landry, Stirling Properties’ Senior Investment Sales Advisor, received the award for Top Overall Retail Production. Sales and Leasing Executive, Joe Gardner, CCIM, was awarded for Largest Land Sale & Largest Landlord Lease. Carly Plotkin, Sales and Leasing Executive, received the Rising Star Award. Rhonda Sharkawy, Senior Retail Leasing and Development Executive, was acknowledged for her induction last year into the CID Hall of Fame after having received the prestigious F. Poche Waguespack Award for the highest volume of sales and leases in the greater New Orleans area for five consecutive years. She is one of only a handful of women to receive this esteemed award since its inception in 1964. Lauren Ryan, Sales and Leasing Executive, was a first-time recipient of the Production Award, given for agents obtaining total commercial credit sales and leasing of more than $2.5 million. Landry, Gardner, and Sharkawy were also among Production Award recipients. The goal of the Commercial Investment Division (CID) Awards is to review and recognize individual achievement among commercial real estate practitioners who are members in good standing of the New Orleans Metropolitan Association (NOMAR) of REALTORS®.